This week is Halloween. It's always a challenge when it falls in the middle of the week, and that's when my Crockpot comes in handy. Even though the kids have half-days, it's tough to fit everything in, like school events, pumpkin carving and Trick or Treating, not to mention dinner. My plan for the last several years has been to make a big batch of chili in the Crockpot so that it's ready to eat when people are hungry. I also whip up a batch of Mummy Dogs, so the kids can eat something before they head out trick or treating, and typically re-heat one up when they get back. It's easy, low-mess and filling . . .perfect before sending your little ghosts and goblins out into the neighborhood. 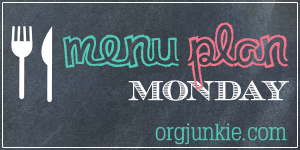 I've linked up my menu plan with I'm An Organizing Junkie. Check it out for more ideas and inspiration, or to link up your own meal plan.